Summertiiiiiiiiiiime, and the living is easy! Especially if you decide to make nachos for dinner. 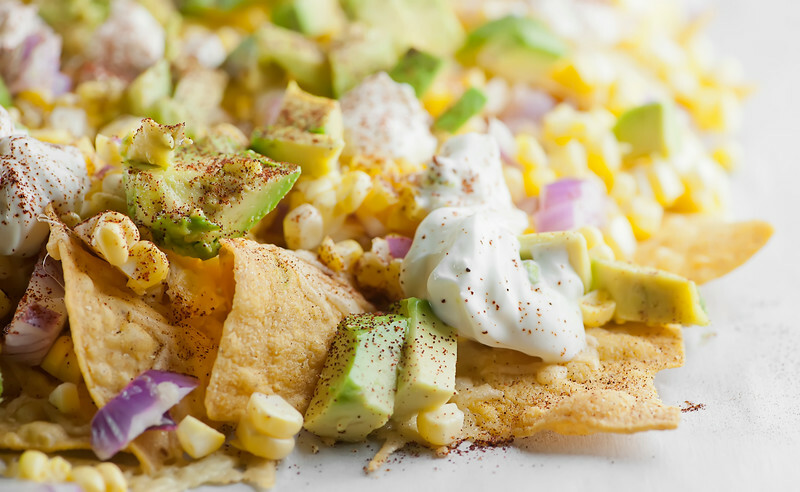 And especially if you swap out the jarred salsa and make these fresh corn nachos instead. Filling in for that jarred stuff is a quick and scrumptious conglomeration of fresh corn kernels, some chopped red onion, and a little lime juice. Add in some chopped avocado, a little melted cheddar, some dollops of sour cream and a sprinkling of chili powder and you have the fresh summertime version of everyone’s favorite nibble. Ready to summertime up your nachos? Let’s make it! Ingredients always matter, but this is one recipe where if you get the fresh local stuff, these nachos will seriously rock. Happily we are smack in the middle of fresh corn season, and step one of this recipe is to head for your local farm or farmer’s market to pick up some ears. Sure, there are big piles of them in the supermarket, but by going right to the source you not only will be assured of great fresh corn, but in many cases you will be supporting your local farm and a small business. Click here to find out if you have a farm or farm stand or farmer’s market by you (I bet you do!) and head on over…they will be so glad to see you, and I can pretty much promise that they have a pile of corn waiting for you. Along with a passel of other fresh fruits and veggies and other good things. I got this gorgeous bouquet yesterday at my local farm stand. And yep, I popped them right into a wide mouth mason jar, because you know I have an undying crush on all things mason jar. 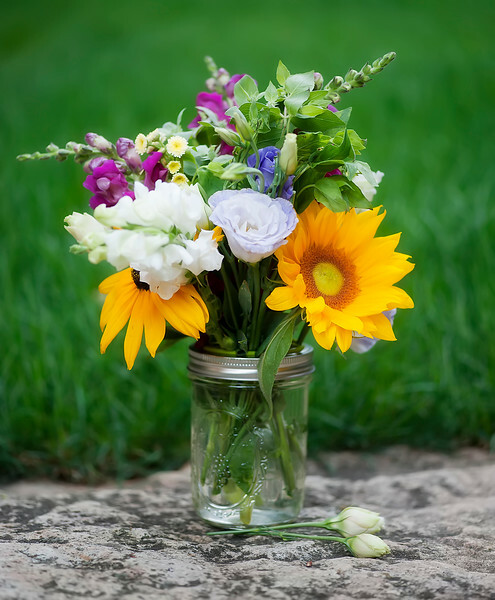 That particular mason jar has a flower frog (one of those grid-like things that helps you get the flowers all standing up straight) which fits right into the lid. Happiness. Anyway, once you have your corn, you want to mix it up with some chopped red onion, some lime juice and a little salt and pepper. Once that is done, spread a layer of your favorite tortilla chips in a single layer on a rimmed baking sheet lined with parchment (the parchment is for super clean-up later, and will help preserve the feeling of pure happiness you get from having just eaten fresh corn nachos). Sprinkle some shredded cheddar cheese on top of the chips, pop the whole thing in the oven until the cheese is melted, and then pour the fresh corn mixture on top. Sprinkle on some chopped avocado, some dollops of sour cream and then sprinkle everything with a little chili powder for just a hint of sass. This of course makes the world’s best summer appetizer, but if you asked me if I have ever served this and only this to the Southern husband for dinner, the answer is HECK YES. Mix together corn, onion, lime juice, salt and pepper and set aside. Spread chips in a single layer on baking sheet. Cover with cheese and bake until cheese is just melted, about 5 minutes. Remove from oven and cover with corn mixture. Spread avocado on top. Dollop with spoonfuls of sour cream and sprinkle with chili powder. Serve at once – I usually transfer the nachos parchment paper and all to a platter, but you can also serve right from the baking pan! I have been making fresh corn weekly, as it’s one of my favorite veggies to get from my local farmer’s market. These nachos are just calling my name, Kate! LOVE the corn and other zesty flavors in here! I’m totally up for nachos for dinner Kate! And these look so totally perfect for summer! Enjoy your week and thanks for sharing this one! I’m jealous of people who can use mason jars. I try, and it never works out. You have a gift! And nachos…oh my goodness, yes. Pass them all! We definitely have a farmer’s market around here.. in fact we have 4 a week. And then there is a farm produce stand open 7 days a week. So trust and believe I have been eating ALL the fresh summer produce! Especially ALLLLLL the corn! I’m slightly addicted (<–understatement).. as I have been eating corn daily for the past month. lol. yeahhh, I have a problem! So you KNOW I totally NEED these nachos immediately! 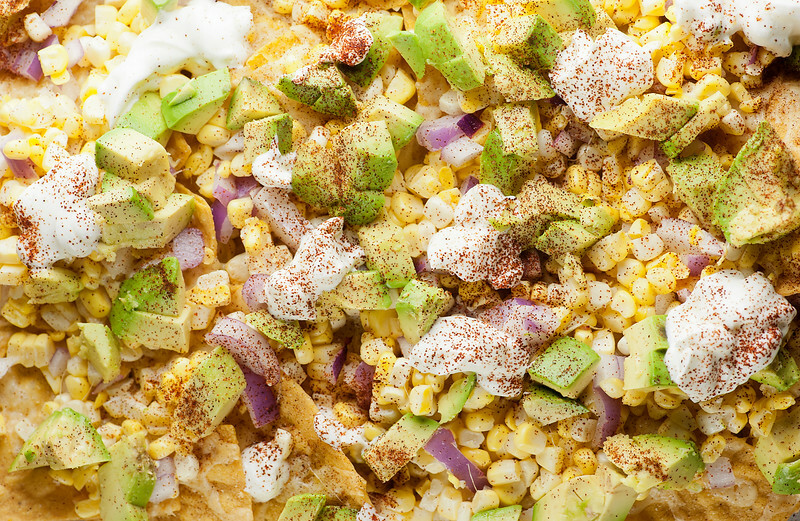 Corn and avocado is a match made in heaven, but topped on some crispy nachos and I'd be in heaven! So much yum! Cheers dear! I LOVE farmer’s markets! I’m like a kid in a candy store whenever I visit one. I want each and every item, but I know I can’t get everything ’cause it’s only hubby and I. So many good things! Those flowers look so gorgeous, too. And, like yourself, love things in mason jars. They make everything look extra pretty and rustic, don’t they? There’s nothing like a good farmer’s market. That’s where I always get my watermelon. Mmm. And speaking of yummy, these nachos are the bomb! So summery. I have never put corn on nachos before. Where have I been? ???? I need to try this. BIG big fan of fresh corn in all of its applications! this one is unique and obviously very appealing to nacho-lover like me!